The Fourth Edition of Preferred Stock Investing includes the latest research and updated charts and examples using real preferred stocks. And Part III "Buying When The Market Favors Buyers" has been completely re-written to focus on the buying conditions that we will be facing throughout 2012. Check out the new Fourth Edition Table of Contents. 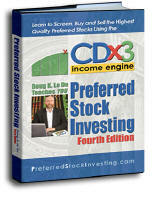 The preferred stock investing method explained throughout the book - the "CDx3 Income Engine" - uses three rules and ten selection criteria to accomplish its three objectives: maximize revenue while minimizing risk and minimizing work. The results are itemized in chapter 15 for every qualifying preferred stock issued since January 2001. A new chapter has also been added (chapter 11, "The Crisis That Keeps On Giving") that describes two specific opportunities for preferred stock buyers. Both of these opportunities were created by the 2007 - 2009 Global Credit Crisis and are expected to remain available well into 2012. Preferred Stock Investing is one of the highest reader-rated books available at Amazon. 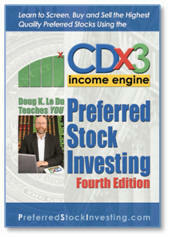 Look for your copy of Preferred Stock Investing, Fourth Edition at your favorite online retailer. The Federal Reserve's low-to-no interest rate policy has pushed preferred stock investors to the top of the pile for yet another year. For high quality preferred stock shares purchased throughout 2011, preferred stock investors earned about 7.3% at what many would consider to be very low risk. Very few others are making that claim. Here are the results for high quality preferred stocks, savers (those investing in bank Certificates of Deposit) and common stock investors (as reflected by the S&P 500 common stock index) for 2011. Thanks to the Fed's low-to-no interest rate policy, which the Fed has committed to for at least another couple of years, market prices for high quality preferred stocks remained stable throughout the year as did their dividend yields. As illustrated by Figure 1, the average annual dividend yield from high quality preferred stocks changed very little throughout the year. These securities started 2011 providing an average annual yield of about 7.4% and closed out the year offering just over 7.3%. (3) is issued by a company that has a perfect track record of never having suspended a preferred stock dividend. There are seven more criteria that ordinary preferred stocks must meet in order to be considered "high quality" as presented here. Figure 2 plots the average annual yield provided to savers by bank Certificates of Deposit (CDs) throughout the year. Bank CD rates are closely related to the federal funds rate so the Fed's policy has pushed CD rates down accordingly. Since the Fed introduced its low-to-no interest rate policy in December 2009, savers have really taken it on the chin. The average annual yield from bank CDs began the year at 1.53% (24-month certificate) and steadily dropped to finish the year returning 1.19% to account holders, a painful reduction from where they started. Savers who had purchased a CD several years ago that matured during 2011 received a real shock. Nest egg dollars that were earning three or four percent are suddenly going to be generating, at most, half the income that they use to. To add insult to injury, annual inflation (as measured by the Consumer Price Index) for 2011 is going to come in at about 3.2% (source: inflationdata.com). That means that inflation during the year ate any returns earned by savers by more than twice over. While the Fed's low-to-no interest rate policy has delivered stable prices and 7.3% returns to those investing in high quality preferred stocks, savers have been decimated. As dismal as the 2011 results are for savers, it is not clear that common stock investors did much better once you consider the risk that they are taking. As illustrated by Figure 3, the S&P 500 common stock index started the year at 1,257.64. This index of common stock performance ended 2011 at 1,257.60 returning an average appreciation of zero to common stock investors (no preferred stocks are included in this index). The average annual dividend paid by these common stocks was about 2%. That means that after taking the risk that is inherent with common stock investing, common stock investors did about the same as those who purchased a bank CD at the beginning of 2011. During the first half of the 20th century the Industrial Age provided the big value driver for American business. And during the second half, it was the Information Age. With the exception of 2003 and 2009, the lack of such a value driver for the 21st century has left value seeking common stock investors empty handed. 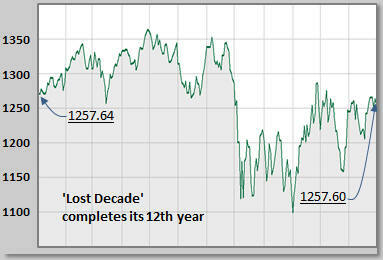 The Lost Decade for common stock investors (2000+) just completed its 12th year. As they have for several years now, the highest quality preferred stocks generated several times the return as that earned by savers or common stock investors throughout 2011. There are about 1,000 preferred stocks trading on U.S. stock exchanges. Of these, there are 17 specific issues that are of particular interest this month. Not only are these the highest quality preferred stocks available but they are providing an average annual dividend yield of 7.03% right now. If that isn't enough, what makes these particular preferred stocks stand out this month is that they are selling for a market price that is below their $25 "par value." Buying your shares for less than par adds a layer of principal protection to your investment. In the event that the issuing company retires ("calls") the shares, shareholders will receive the par value ($25 per share) in cash from the company. By purchasing your shares for less than the par value ($25), you position yourself for a nice capital gain to pile on top of the great dividends that these high quality preferreds pay you in the meantime. To protect the value of subscriptions to the CDx3 Notification Service (my preferred stock email alert and research newsletter service), trading symbols are obscured here. But here's how to find these high performers out of the 1,000+ available candidates. 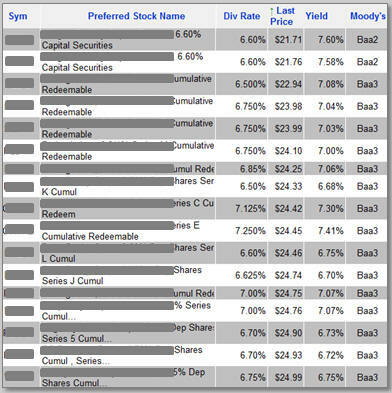 Criteria #1 - Investment Grade: By limiting the choices to those preferred stocks with a Moody’s investment grade rating, we cut the list almost in half in one shot, down to about 600 issues. With 600 investment grade issues to pick from, most risk-averse investors would rather not fool around with “speculative grade” alternatives. 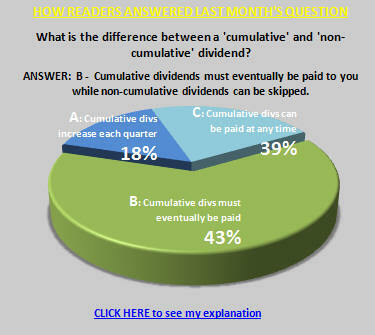 Criteria #2 – Cumulative Dividends: With common stocks, if the company decides not to pay a dividend, you’re out the money. But many preferred stocks have a “cumulative” dividend provision, meaning that if the issuing company misses a dividend payment to you, it still owes you the money downstream (its obligation to pay you accumulates). Limiting our choices to just cumulative dividend preferred stocks eliminates another 200 pretenders. These two criteria (investment grade and cumulative dividends) are pretty easy for most risk-averse investors to warm up to. We are down to about 400 remaining candidates. Criteria #3 – Minimum Rate of 6.5%: Historically, the highest quality preferred stocks carry annual coupon rates between 6% and 9%. Not too bad compared to the ~1.3% being paid by bank CDs. But rates go up and down over time and you want to be sure that you always have some breathing room if rates fall too far. A 6% preferred stock (i.e., the bottom of the barrel) can become harder to sell once rates start rising again and higher paying alternatives are introduced. Preferred stock investors can avoid this pitfall by simply sticking with preferreds that offer a fixed dividend rate of at least 6.5%, giving you time to sell once rates bounce off of 6% and begin heading back up. That takes us to about 150 remaining issues. 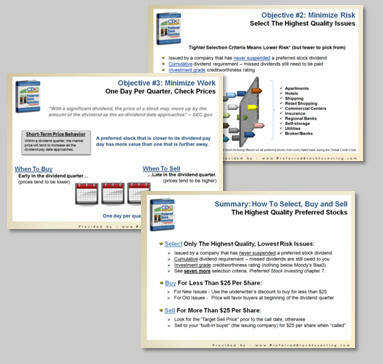 By applying all ten of the criteria from chapter 7 of my book, Preferred Stock Investing, and then focusing on just those that are available for less than $25 per share, we are left with the high quality issues that you see here. This list was generated using the Preferred Stock List(TM) software tool available to those subscribing to the CDx3 Notification Service (my preferred stock email alert and research newsletter service). Already a subscriber? The trading symbols of these 17 high quality preferred stocks are listed in a January 3 post on the CDx3 Discussion Group titled "17 Symbols." (Already a subscriber? For symbols see the January 3 post titled "17 Symbols" on the CDx3 Discussion Group). Interest rates fluctuate over time and with them the market prices of fixed income securities such as preferred stocks. Knowing this allows savvy preferred stock investors to take advantage of increasing, stable and decreasing rate conditions. For the past two years the Federal Reserve has had a very low interest rate policy in order to help stimulate the economy. While savers (those investing in bank Certificates of Deposit) have been decimated by this policy, preferred stock investors have enjoyed very stable dividend returns of about 7% from the highest quality issues. In August 2011 the Fed announced that it will remain committed to today's low-to-no rate environment for at least another two years and they reiterated that commitment again in December. While there is no near-term concern about increasing rates, preferred stock investors have a number of tools available to them to protect their principal going forward. Historically, the dividend rates offered by the highest quality preferred stocks (those that are able to meet the ten selection criteria from chapter 7 of my book, Preferred Stock Investing) range between 6% and 9% with very few exceptions. Many preferred stock investors own such shares purely for the regular dividend income; they are buy-and-hold investors and are generally less concerned about market price fluctuations. But for others who may need to cash out their principal, today's market price of their preferred holdings becomes more important. While there is nothing wrong with a 6.0% dividend, when dividend rates come back up off of 6.0%, holders of 6.0% issues will often find themselves unable to sell them without a capital loss. By simply putting a floor at 6.5% preferred stock investors can avoid purchasing preferred stocks that they cannot, over time, sell in order to recover their principal.